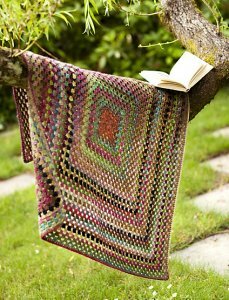 This awesome throw or afghan design uses Noro's stunning self-striping Silk Garden yarn and the traditional Granny Square design to create a super modern blanket for your home! The pictured color combo is offered below. Feel free to call our customer service department at: (877) JBW-KNIT to create a custom kit! Finished Measurements: Throw- 40"X40", Afghan- 50"X50" after blocking. Gauge: 4 dc clusters over 4" after blocking. Colors Shown are: 311, 279, 309.